Surgery for Cancer involves operation that is done to remove tumour. 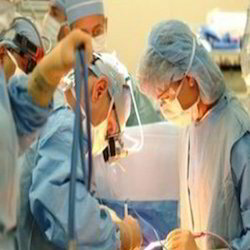 Surgeries are often done if cancer is present only in one part of body and has not spread across. This process is also used for removing lymph nodes if these are also affected by cancer. The type of operations depends on area of body that is affected by cancer as well as also on size and position of tumour. Cancer is a group of diseases that cause cells in the body to change and grow out of control. Most types of cancer cells eventually form a lump or mass called a tumour, and are named after the part of the body where the tumour originates. To meet the ever-growing needs and demands of our honored patrons, we are engaged in rendering an elite array of Cancer Surgery services. These services are carried out by highly experienced cancer doctors & surgeons who give their best so as to render these services for effective results and optimal quality treatment. At Sai Hospital, Haldwani, Uttarakhand we are committed are to deliver highest quality and advanced oncology care in a supportive and compassionate environment to all our patients. Most cancers from different digestive organs in the abdomen spread to the liver causing secondary deposits. Secondary cancer deposits from colon cancer are amenable to liver resection.